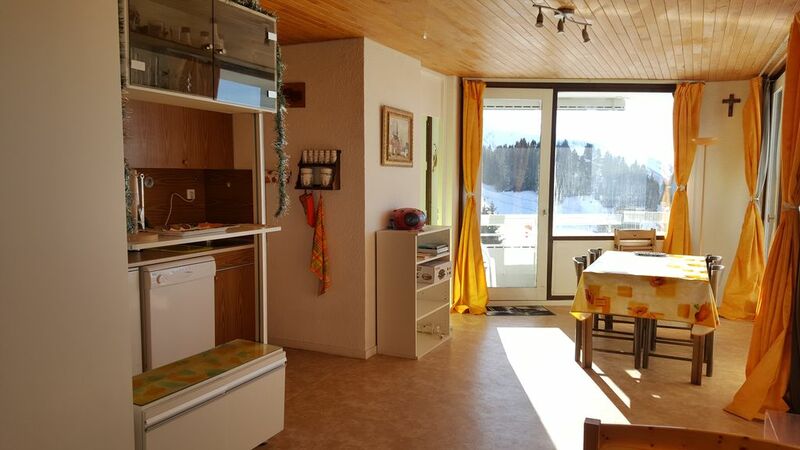 ideally located: directly on the ski run; Entirely renovated (August 2008); 2 large balconies (+ of 12m2 in concurrently) having a round table and 4 chairs; splendid sight on all the Grenoble-native basin; impressive panorama on the Vercors, Belledonne and Chartreuse massifs; sliding scale tariffs according to the duration; apartment enjoying a period of sunshine from early AM to late PM; Chamrousse (Olympic ski resort); Very well equipped (dishwasher, microwave oven, TV). "Very nice accommodation with excellent views of the mountains from the balcony. The flat is right by the piste, so you can put your skis on and ski down to the chairlift. Chamrousse as a resort is brilliant for beginner to intermediate skiers, with plenty of blue and manageable red runs, and very friendly bar and restaurant staff. Would definetely recommend this apartment and would stay again"
We have had a brilliant holiday and the apartment definitely exceeded our expectations. It is spacious, with lots of storage and the two balconies gave an amazing view of Chamrousse. The owner is very friendly and helpful and went out of his way to accommodate us. Would definitely recommend and am hoping to be back next year. Cest avec plaisir que nous vous recevrons à nouveau. Very easy access at 30 km of Grenoble . Take the direction to URIAGE. Then follow CHAMROUSSE. The apartment is located at ROCHE BERANGER. We are at your disposable to provide you with maps upon request by email. Access not overloaded even during the tourist season. By train: Paris - Grenoble 3 hours of TGV + 1 hour 15 mn by coach. By the road: Grenoble: 30 km - Lyon: 130 km - Marseille 330 km - Paris 605 km. From Paris , A6 motorway to Lyon A46 motorway, then A43, and A48 to Grenoble , then Southern bypass, Chambéry direction left at #2 Exit (Gières, Uriage). In Uriage, two beautiful roads lead you to Chamrousse: one in Chamrousse 1650 and the other in Chamrousse 1750. Choose the latter and you will directly arrive in ROCHE BERANGER. By plane: Saint-Exupéry or Grenoble airports. Freestyle spaces: Snowpark, Big Air, Boarder cross-country race, Kidpark, sequence of Slope Style modules, snow bike, driving on ice, diving under ice, acrobranche open all the year, cable car also opened in summer, monster bike, parapente, sporting space of orienteering, mini-golf, skate and roller park, via ferrata, Quads, tennis, nordic walking, riding centre,… you can also play Golf, take the waters, go to Casino at Uriage (approximately 15 km).